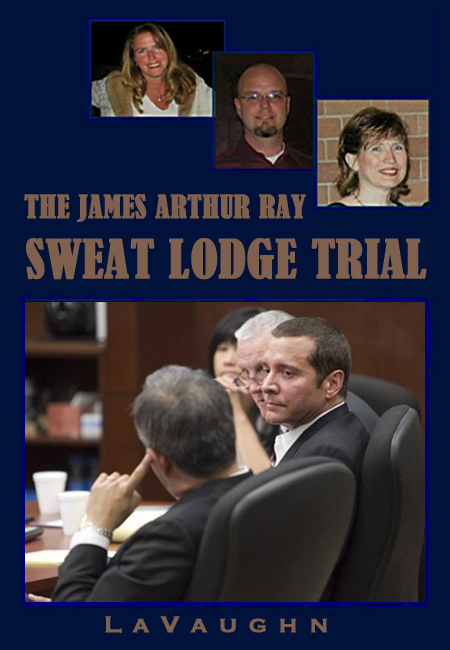 Most interesting is what Joy reveals about Ray's behavior in and around the courtroom which she's observed firsthand. Much in keeping with his horrifying "WooHooo!!" tweet immediately following the Brady violation ruling, his insensitivity to bereaved family members is stunning. She describes him "yucking it up" with his lawyers during breaks a few feet away from Ginny Brown and other family members. Joy also recounts his attempt to physically intimidate her by abruptly pushing past her, like she was invisible, to greet a reporter. It's always disturbing to see the man behind the curtain when it turns out the hidden operator is probably a sociopath. Joy has learned a lesson I did some years ago about projecting our own values onto other people. In my own experience of dealing with sociopaths, which I have more than once, they rely on a combination of their own ability to mimic human behavior and the tendency of people with normal emotions to rescript their red flag statements and behaviors. Seeing them for who they really are is too shocking and painful. The more compassion and empathy we have for others, the more inconceivable we find its lack. This is what con artists and their ilk count on. James Ray surrounded himself with lovely, generous, open-hearted people. Watching so many on the stand as they wrestle with the dawning realization of how really traumatized they are has been a painful reminder of how many people can be severely wounded by one man's pathology. It would seem that Mark Rock is another of the walking wounded. If his testimony is to be believed, he is suffering from PTSD and repressed memories of his ordeal at the 2009 sweat lodge. I have no idea how Rock came across or whether or not I myself would find him credible because CNN no longer streams the trial onto my computer. But, according to Mark Duncan, that is how Rock explains the disconnect between his post-event police interview and his current testimony. Certainly one of the things we've seen a lot of with these witnesses is the various stages of eroding denial. Laurie Gennari comes to mind, just because she articulated it so well. According to Rock, his healing process has forced him to address the guilt he felt for not saving Kirby Brown. "At the end of the sixth round I heard Kirby gurgling her last breath, I thought, and I heard somebody say 'Kirby's in trouble - she needs to get out,' and I heard James Ray say, 'Close the gate. We'll get back to her at the end of this round.'" Emotional at times, Rock tried to explain why his testimony was important to his ongoing healing process, a salve to the psychic wounds he suffered in the sweat lodge. "Once I fully remembered everything I didn't do, it became impossible to forgive myself for that," he said, noting that his altered mental state froze him in a posture of futility. "I was there for the people in the sweat lodge and I couldn't do anything to help them." The other evening I noticed the M*A*S*H finale in the program lineup. I thought about watching it but the truth is I found it too upsetting the first time. I don't know if I could ever sit through it again. In it Hawkeye has a nervous breakdown after surviving an enemy attack and discovers in therapy that he's distorted his memory of the event because the reality is too painful. During the final days of the Korean War, Capt. Hawkeye Pierce has been sent to a mental hospital for treatment by Dr. Sidney Freedman. Pierce's memories of what led to his breakdown have become repressed, and as he and Freedman draw them forth, Pierce at first remembers the details inaccurately. In Pierce’s first recollection, he was on a bus returning to the 4077th after a day of drinking at the beaches of Incheon. He called for a bottle of whiskey to be passed back to someone who “can’t wait”; later, he is able to more accurately recall this person was a wounded soldier, and that the bottle was filled with not whiskey, but plasma. The bus then picked up some South Korean refugees, followed by some wounded soldiers who brought news of an enemy patrol in the area. The bus later pulls off the road and everyone is told to stay quiet so they would not be discovered by the enemy. One woman carried a live chicken that would not stop squawking, prompting Pierce to angrily admonish her to “keep that damn chicken quiet!”, after which the noise suddenly stopped. This last detail causes Pierce to break down sobbing as he finally reveals the true ending of the story. When Hawkeye snapped at the woman, he had told her to keep not a chicken quiet, but rather her baby. Unable to keep the baby from crying, the woman made the decision to smother her own child to silence it and protect the lives of the people on the bus. Upon seeing what had happened, Pierce was so traumatized that he repressed the memory of what occurred. Once back at camp, he attempted to operate on a patient without anesthesia, while accusing the anesthesiologist of trying to smother the patient. But it was a later incident, driving a jeep through the wall of the Officers' Club and ordering a double bourbon (which Pierce never drank), that caused Pierce to be committed to the mental hospital. I don't know if Mark Rock is telling the truth when he says he is only now recalling buried truth and shame from that day. I do know that the our minds have an incredible capacity to protect us from pain. Denial is kind of band-aid. At some point we have to remove it because it no longer serves us. But ripping it off is invariably painful. Been there. Rock may have put himself in real jeopardy by testifying as he has. The defense has made a request to have his testimony stricken and cites his own attorney as saying that he was "determined" to perjure himself. So far that's the only coverage of today's proceedings I've been able to find. Although April Santiago did some much appreciated live tweeting from the courtroom. She reported that Rock was very emotional as he described the impact on his life. She also reported that there was more legal wrangling over whether or not he could testify to the Dream Team's request that he not cooperate with authorities but that ultimately he was not able to give that testimony. Also from Santiago, Tom Kelly grilled Rock about his inconsistencies and played recordings of his original interviews. Santiago also found them to be quite different in tone and notes that he attributes this to PTSD. Kelly also did some saber rattling about "lying under oath." Mark Rock was excused subject to recall. Santiago also tweeted that CNN may stream the closing arguments. I call that too little too late. I guess Kelly really stepped in it. 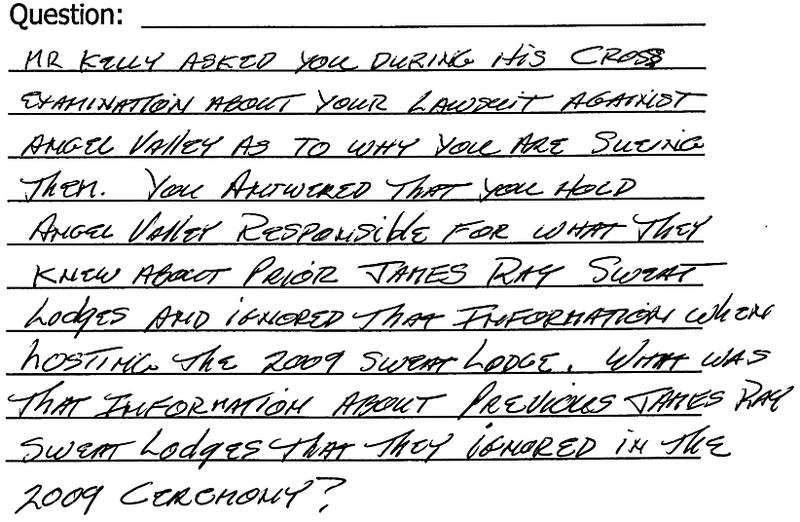 As CNN has stopped streaming, I don't know whether or not Judge Darrow elected to pose this question to Rainey. I'm presuming not as it gets into hotly disputed material about prior events but it looks like there was enough presented during cross examination to raise a red flag for at least one juror. Damn. This is exactly the kind of courtroom drama I hate to miss. For now, that's the extent of available media coverage from today. A reader reminded me this morning that the In Session blog still provides some fairly decent, if spotty, coverage. Here's a recent write-up. 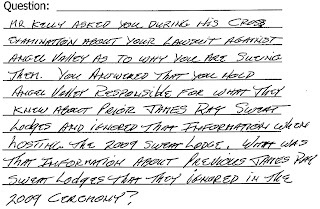 The only really new piece of info is that Sheila Polk tried and failed to have Fawn Foster testify on causation because of her experience in a non-James Ray sweat lodge in the same structure. Also worth noting on that blog is the lengths CNN and the In Session team will go to to bury any coverage of this trial. Here is their category listing. See their tags for James Arthur Ray or Sweat Lodge in that listing? Neither do I. Make no mistake. CNN hates this trial. It's thinky. Making people think annoys advertisers. And they love James Ray. He and The Secret fueled consumer culture like a crack cocaine. I don't think the infotainment industry was prepared to see the whole phenomenon so tarnished by this trial. They've been trying to wish it into the cornfield ever since. I checked in with CnnLive numerous times today while the James Ray trial was in session just because I wanted to see what other news is so bloody important. As you can see, a lot of it is weather and empty feeds. Not once during the hours of the trial did I see all four feeds taken up with actual, breaking news. That "severe weather in northeast" is certainly newsworthy. We had a hailstorm here and people were killed by a tornado in Massachusetts. But that feed didn't cover any of that. It was actually just another weather map. Helpful. Obviously CNN really needs to dedicate feeds to something the weather channel does so much better. Years ago, when Fox News began eroding CNN's market share, I thought their craven attempts to remake themselves into Fox Lite put them on a path to total irrelevancy. They're proceeding at a pace. THANK YOU for the comprehensive updates. I too have been following the trial for weeks and am also EXTREMELY frustrated with CNN. Its all about Casey Anthony now... because it's so sensational! A mother who kills her two year old is an aberration. But there are MANY other "Guru's" like JR out there, and the public needs to know of the dangers!!! !